Egypt’s President Abdel Fattah al-Sisi stressed Egypt’s full support to gulf states in a meeting with the Supreme Council of the Armed Forces on Saturday. Sisi said during the meeting that Egypt is moving within a “political framework to avoid all losses,” according to a presidential statement. He added that Arab national security will only be secured with the unity of all Arab countries. “Egypt will not abandon its brothers in the gulf; we will protect them if it is required,” Sisi said, adding that Yemen’s strategic Bab al-Mandeb Strait is a matter of Egyptian and Arab national security. Saudi Arabia is carrying military operations in its conflict-torn neighbour Yemen as part of a coalition that includes 9 other countries, Egypt among them. Egypt fears that the Houthis’ control over Bab al-Mandeb would affect navigation into the Suez Canal. The SCAF meeting followed the return of Egypt’s Chief of Staff Mahmoud Hegazy from Saudi Arabia, where he was attending a meeting of chiefs of staff of Arab countries to discuss a proposed joint Arab force. Last week, Arab leaders agreed in principle to establish a unified military force at the end of the Arab League summit hosted by Egypt, but Iraq has expressed reservations to the proposed force. AL Secretary General Nabil al-Araby said the proposed joint force will include the league’s member states that are willing to partake, stressing that membership in it is “optional”. 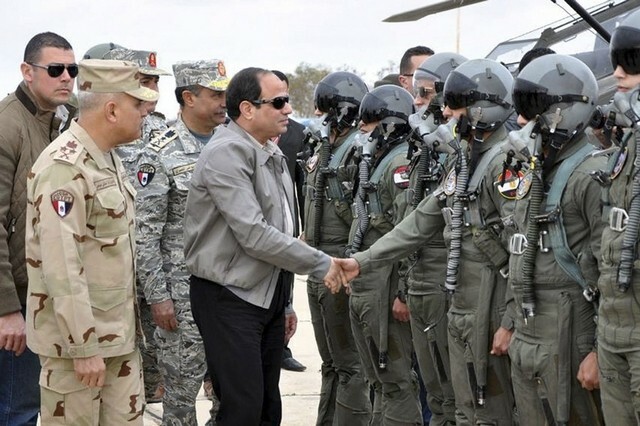 Egypt backs the joint force and has been steadfast on calls to establish it, especially since launching air-strikes on militant targets in Libya in February. Several Arab countries are currently battling a wave of militant insurgency including Syria and Iraq, where large areas have fallen under the control of Islamic State fighters. Libya and Yemen have also fallen into the turmoil gripping the region. SCAF said in a statement that the meeting also discussed the latest deadly attack in North Sinai on Thursday, which claimed the lives of at least five security personnel and 15 suspected militants.